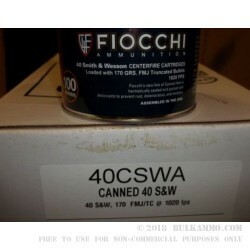 Fiocchi’s FMJ .40 S&W canned heat delivers the major benefits of the improved packaging for those who know they want or need a long-term storage solution for the ammunition that they are buying. In this case, the .40S&W is a full metal jacket round that offers a 170 grain projectile which is already an interesting proposition considering what most shooters of the caliber are used to; clad in brass alloy. The “Canned Heat” product line protects the rounds against moisture and oxidization through the hermetically sealed lid system that is similar to the way certain items get packed in grocery applications (like canned fish or meat). This allows you to buy long term storage ammunition by the case lot and have it unaffected by any environmental conditions that most shooters will ever face. That doesn’t mean you cannot shoot the ammunition just because the packaging is suitable for long-term storage. It is perfectly acceptable to shoot, especially given the quality and reliability of the round. 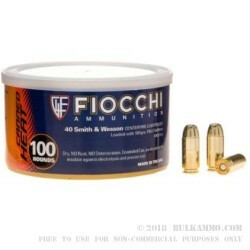 The tiny price premium of the load over its same brand peers, is negligible when compared to the rest of the market, as Fiocchi is often the cheapest offering for FMJ new manufactured ammo anyways. This is a 1000 round case lot of ammunition: 100 rounds per can, with 10 cans. Q: Is this new brass or reloaded? Are they canned with a moisture absorber? A: Fiocchi Canned Heat ammo is loaded with new brass, and there is a desiccant inside the can. However, more importantly, the can itself is airtight.